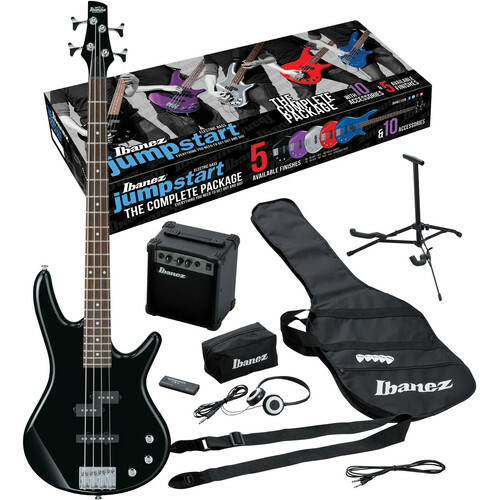 Designed by Ibanez to give you everything you'd need to get started playing the bass, the IJXB150 Jumpstart includes a four-string electric bass, a 10W bass amplifier, a cloth strap, a gig bag, an electronic tuner, a pair of headphones, a stand for the bass, an instrument cable, picks, and an accessory pouch to store much of your gear when you're not using it. The bass itself, styled in a black finish, is modeled on their 200 series basses, giving you a double cutaway design, albeit with a poplar body instead of mahogany. The bass's GSR4 maple neck is fitted with a 34" scale rosewood fingerboard and 22 medium frets. For electronics, passive pickups offer P-style tone in the neck position and J-style timbres at the bridge. Two volume knobs and a tone control allow you to control the instrument's various timbres. This bass, alongside the rest of the gear listed above, will provide you with all the elements involved in learning how to play the electric bass. Box Dimensions (LxWxH) 45.3 x 19.5 x 8.1"